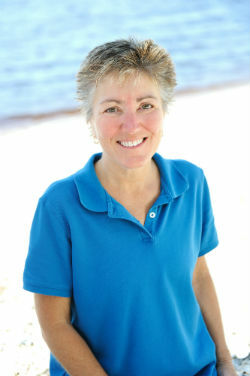 Dr. Kathy Duford graduated from Michigan State University’s School of Veterinary Medicine in 1996. She is known affectionately to her clients and staff as just “Dr. Kathy”. Her gentle nature and soft-spoken words make her a natural with her animal patients. 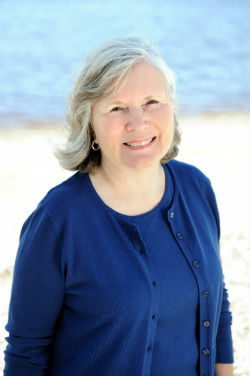 Dr. Kathy has a growing interest in acupuncture and holistic medicine and is teaching herself to play the guitar. Pert has a background in education, administration and landscaping. 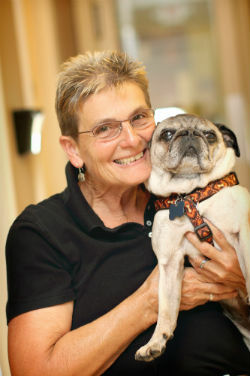 Her diverse work history makes her a natural leader as Waterway Animal Hospital’s Practice Manager. 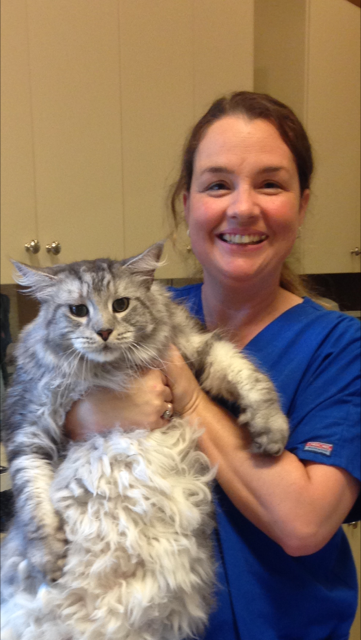 She has an immense passion for our feline patients and is known to staff as “The Cat Whisperer”. In her free time she keeps the grass, trees and plants surrounding the clinic looking beautiful! Dr. Kathy and Pert enjoy going to the beach and pontooning on the waterway. They love their two pugs, Thelma and Louise (aka double trouble!) and 2 cats, Mango and the newest addition Karma, who on a busy afternoon just showed up at the office! 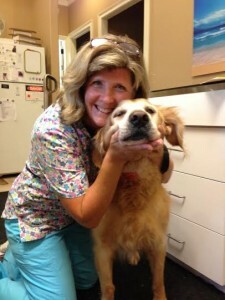 Dr. Kathy opened the side door to our office and in walks Karma and here she stayed! In their free time, they like to spend time with friends and family, go on travel adventures, and take walks with their dogs. 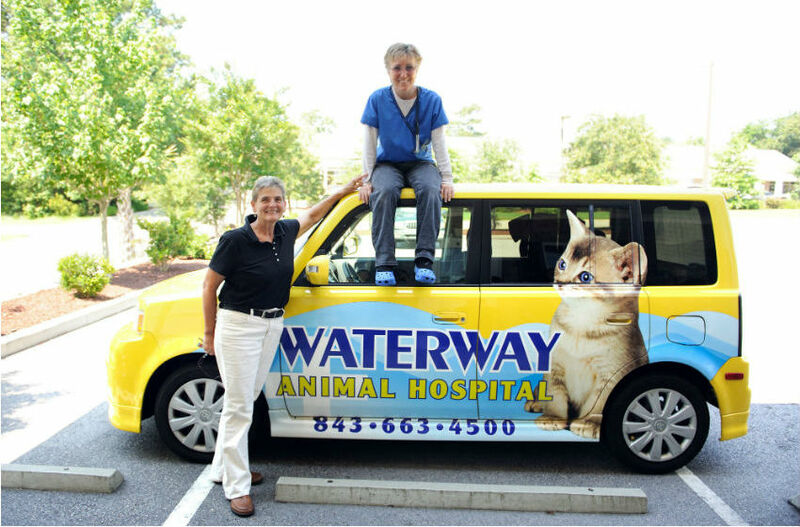 Aoife is our senior technician and was the first member of Dr. Kathy’s team in 2006 when Waterway Animal Hospital opened its doors. Born in Dublin, Ireland, she moved to SC in 1996. Aoife fondly remembers her very first pet, Silver Lady, a Connemara Pony who first sparked her passion for animals. Aoife has a 2 year old rescue cat named Kona! Debbie is our lead receptionist and also a technician, with 37 years experience. 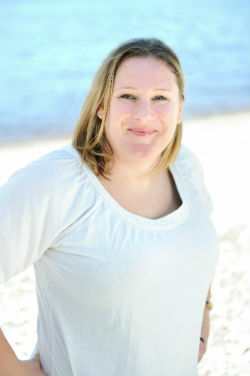 Debbie joined our team in March 2011. 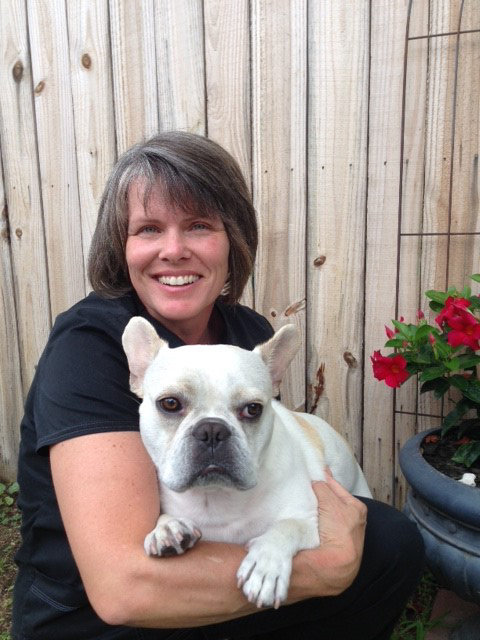 In November 2017 Debbie and her husband Keith adopted a French bulldog from North Myrtle Beach Humane Society. Some days Quincy can be found behind the front desk snoozing (aka snoring loudly) in his bed. Debbie is outgoing, sociable and is very fond of the company of our clients. When she is not at work Debbie and her husband love to travel, sail and hike and spend time with their grandkids. We are so happy to have Angie rejoin our team in May 2018. Angie has over 10 years of experience as a technician and several of those years she worked with Dr Kathy and Aoife. Angie has 2 beautiful children and a dog named Sugar and 2 cats and loves them all! Bess and her husband Craig moved to the beach in June 2017 from Fort Mill SC and joined our team in September 2017. They have been married for 27 years and have a 21 year old daughter named Ashlee. Bess enjoys walking on the beach, volunteering with the homeless and loves her Clemson football team, but most of all spending time with her beautiful family. Diane is one of our receptionists who will greet you at the front desk. She relocated to Little River from Pennsylvania in 2013. She graduated from Valley Hospital School of Radiography in Ridgewood, NJ, in 1986. She has over 30 years in patient care and administrative work. Before working with us, Diane was a client who regularly brought in her pets to Waterway knowing they would be well cared for and decided to expand her horizons and became a member of the Waterway team in January 2014. Diane is married and has two wonderful daughters that she is very proud of. She enjoys walking on the beach with her dogs, watching the sunsets with her family, and traveling to new places. Joyce, who just happens to be Dr. Kathy’s mother, works as a part time receptionist. She also has been with us since 2006. 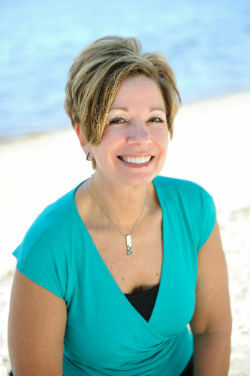 She grew up in Michigan and worked many years as a receptionist in a dental office. She and her husband, John, came to the Carolinas for their retirement. They have two dogs, Buster and Dolly, both Shih Tzus. You’ll find them both snoozing under her desk in the front lobby. Chris has been grooming pets for eighteen years and came aboard here at Waterway in March 2011 as our first and only groomer! Before pursuing her grooming training, Chris was a banker. She grew up in rural New York. Chris and her husband David have their own little “farm” with horses, dogs and several rescued cats. If your cat is 3, it is 21 in human years.